Oncolytic viruses (OVs) are multimodal cancer therapeutics, with one of their dominant mechanisms being in situ vaccination. There is a growing consensus that optimal cancer therapies should generate robust tumor-specific immune responses. Immunogenic cell death (ICD) is a paradigm of cellular demise culminating in the spatiotemporal release of danger-associated molecular patterns that induce potent anticancer immunity. Alongside traditional ICD inducers like anthracycline chemotherapeutics and radiation, OVs have emerged as novel members of this class of therapeutics. OVs replicate in cancers and release tumor Ags, which are perceived as dangerous because of simultaneous expression of pathogen-associated molecular patterns that activate APCs. Therefore, OVs provide the target Ags and danger signals required to induce adaptive immune responses. This review discusses why OVs are attractive candidates for generating ICD, biological barriers limiting their success in the clinic, and groundbreaking strategies to potentiate ICD and antitumor immunity with rationally designed OV-based combination therapies. The immune system is a critical factor in cancer development and resolution. In 2004, Dunn, Old, and Schreiber (1) described the three E’s of cancer immunoediting: elimination, equilibrium, and escape. By the time cancer patients reach the clinic, tumors have evaded immune recognition and engaged in complex cell-to-cell (2) and systemic (3) signaling to drive immunosuppression. An emphasis of cancer research is therapies that overcome immunosuppression and tolerance to reawaken the immune system to kill cancer cells. Immunogenic cell death (ICD) engages multiple conserved cell death pathways, triggering an immune response against tumor Ags and culminating in antitumor immunity (4). The engagement of overlapping, phylogenetically conserved cell death pathways in ICD results in the spatiotemporal release of danger-associated molecular patterns (DAMPs) from dying cells (5) (Fig. 1A). Critical DAMPs initiate responses by attracting innate cells, particularly dendritic cells (DCs), to the tumor. DAMPs mature Ag-carrying DCs, endowing them with the ability to activate tumor-specific T cells. Thus, ICD is tied to the danger hypothesis (6), wherein factors produced by stressed and dying cells alert the immune system without an obligatory role for foreign inflammatory stimuli. (A) ICD causes the release of DAMPs (HMGB1, ATP, ecto-CRT and type I IFNs) from dying tumor cells. These DAMPs attract innate effector cells, like DCs that acquire tumor Ags and receive maturation signals. Extracellular ATP binds to the purigenic receptors P2Y2 and P2X7, which promote recruitment and maturation of DCs, respectively. Ecto-CRT binds to low-density LRP1 and promotes phagocytosis and induction of proinflammatory cytokines. HMGB1 binds to TLR-4 and receptor for advanced glycation endproducts, which promote production of cytokines and Ag cross-presentation. Type I IFNs bind to their cognate receptor (IFNAR) and drive the expression of a large array of IFN-stimulated genes that support the induction of acquired immune responses. Mature DCs can present tumor Ags to cancer-specific T cells leading to antitumor immunity via production of the effector cytokine IFN-γ and cytolysis mediated by the release of granzyme B and perforin. (B) OVs infect and preferentially kill cancer cells. Tumors facilitate the spread of OVs, and tumor cell lysis releases TAAs. During the virus life cycle, PAMPs are released, which stimulate PRRs that in turn induce antiviral type I IFNs and inflammatory cytokines. Different viruses engage or inhibit cell death pathways leading to an array of cell death phenotypes that are immunogenic, including pyroptosis, necroptosis, immunogenic apoptosis, and autophagic cell death. Several therapies can elicit ICD, including select chemotherapies, radiation, high hydrostatic pressure, photodynamic therapy, small molecules, and oncolytic viruses (OVs) (4, 7–10). Theoretically, potentiating ICD has the advantage of stimulating a patient’s immune system in an Ag agnostic manner, making it personalized, yet broadly applicable. It is likely that ICD inducers will be optimal when used in combination with other therapies by involving multiple overlapping death pathways. The critical DAMPs in ICD are commonly referred to as the hallmarks of ICD. These DAMPs are endogenous factors that translocate to abnormal cellular compartments in a temporal cascade. Translocation of calreticulin (CRT) from the endoplasmic reticulum to the cell surface (forming surface-expressed CRT [ecto-CRT]), secretion of ATP and nuclear high mobility group box 1 (HMGB1), and the production of type I IFNs all precede ICD (11, 12) (Fig. 1A). Once translocated, DAMPs interact with receptors and stimulate cellular and cytokine responses against cancer-derived Ags. The prototypic framework of DAMP translocation was largely delineated from studies using anthracycline chemotherapies in murine cancer models (8). Upon therapy-induced ER stress, Ca2+ efflux, and accumulation of reactive oxygen species, CRT complexes with ERp57 during transport from the ER and docks on CD91/low-density lipoprotein receptor-related protein 1 (LRP1) (13) (Fig. 1A). Ecto-CRT/ERp57 signals through CD91 and scavenger receptors SR-A and SREC-1 (14, 15) on innate immune cells, promoting phagocytosis and NF-κB pathway activation (16, 17). Heat shock proteins (HSPs) also translocate to the cell surface during ICD and similarly stimulate tumor Ag uptake (18). Extracellular ATP is a potent chemoattractant and is intimately linked to autophagy, which helps attract DCs (19). Intensive research identified a multiplex pathway for ATP release (20). Activated caspase-3 cleaves and activates Pannexin 1, which translocates to the cell surface to mediate ATP secretion (21). DCs follow extracellular ATP gradients via binding to purinergic receptors; P2Y2 facilitates recruitment of DCs, whereas P2X7 stimulates maturation (Fig. 1A). HMGB1, a primarily nuclear nonhistone DNA-binding protein, is also a pleiotropic cytokine and chemokine that is released by leukocytes in response to inflammation (22). During viral infection, type I IFN signaling causes hyperacetylation of HMGB1, promoting its secretion (23, 24). Once secreted, the redox form of internal cysteine residues determines its cytokine or chemokine function (25). HMGB1 is passively released by dying cancer cells during ICD and secondary necrosis (26). HMGB1 signals through TLR-4 and receptor for advanced glycation endproducts on DCs, eliciting proinflammatory cytokine production and cross-presentation of tumor Ags to T cells (27–30) (Fig. 1A). As a prognostic biomarker, elevated tumor or serum levels correlate with poor outcomes (31–33) and drug resistance (34), whereas low serum levels may stratify patients for novel immunotherapies (35). Paradoxically, chronic release of HMGB1 by tumors may aid in survival and metastasis (36–38), whereas acute release after cell death may induce tumor-specific immunity. A myriad of other molecules are implicated in ICD (11, 39), but they are not considered critical for bona fide ICD, as demonstrated by prophylactic vaccination of mice with killed cancer cells that protects against subsequent tumor challenge (40). The contribution of other DAMPs to ICD may be revealed as research continues. For example, type I IFNs signal autocrinely and paracrinely to stimulate expression of an immense array of IFN-stimulated genes, driving inflammatory responses against Ags (12, 41) (Fig. 1A). Type I IFNs are important when considering ICD induced by infectious agents such as OVs, because viruses are classic agonists of the IFN response. As preclinical research into ICD continues, adherence to certain standards to define ICD inducers will be critical (11). The dogma of cancer immunotherapy has T cells driving an anticancer immune response. Because induction of cytotoxic T cells is dependent on the activation and maturation of DCs, research on ICD has focused primarily on the DC–T cell axis. However, other effector subsets undoubtedly play a role in ICD. Although NK and B cells play important roles in responses against cancers, and many immunotherapies attempt to amplify their efficacy, only NK cells have been considered in the context of ICD. DCs bridge innate and adaptive immunity by presenting Ags to T cells. They express a large repertoire of pattern recognition receptors (PRRs), which enable them to interact with a broad range of stimuli. In ICD, DCs are recruited to the tumor microenvironment (TME) by ligation of TLR4 and P2Y2 with HMGB1 and ATP, respectively. Dying cancer cells are rapidly phagocytosed if they express ecto-CRT, which binds LRP1, SR-A, and SREC-1 on DCs (14, 15). In murine cancer models treated with immunogenic chemotherapy, recruitment of myeloid cells orchestrated by ATP secretion from dying tumor cells promoted in situ differentiation into mainly CD11c+CD11b+Ly6CHi inflammatory DCs (42). These DCs surrounded caspase-3+ tumor cells and locally primed T cells, indicated by the preservation of antitumor immunity upon removal of tumor-draining lymph nodes and pharmacological inhibition of tertiary lymphoid structures. Thus, immunogenic chemotherapy can promote DC recruitment and maturation in an ATP-dependent manner, leading to activation of tumor-infiltrated T cells. As such, the addition of immune checkpoint inhibitors could be particularly effective at improving the function of suppressed tumor-infiltrating T cells (43). Oxaliplatin-cyclophosphamide (Oxa-Cyc) treatment recruited CD103+ DCs to the TME of murine lung adenocarcinomas harboring low T cell numbers. CD103+ DC priming of CD8+ T cells in the presence of immune checkpoint blockade increased the ratio of effector T cells to regulatory T cells (TRegs), a positive biomarker for solid tumors (44). Although CD103+ DCs are a rare myeloid subset within the TME (45), they are the primary cells responsible for carrying tumor Ags to draining lymph nodes. Delivery of FLT3L with the TLR3 agonist polyinosinic:polycytidylic acid increased recruitment, differentiation, and maturation of CD103+ DCs via the type I IFN axis, improving tumor-specific T cell responses and making tumors sensitive to immune checkpoint blockade. One could perceive a therapeutic regimen wherein cancer-specific OV therapy replaces poly(I:C) to generate potent type I IFN responses and an immunogenic TME to overcome resistance to immune checkpoint inhibition. NK cells express activating and inhibitory receptors, with the net balance of their ligation discriminating between dangerous and normal cells. Upon activation, NK cells in the TME produce proinflammatory cytokines and influence adaptive immunity through interactions with DCs and direct effects on T cells. NK cell–derived IFN-γ and TNF-α promote upregulation of costimulatory and migratory markers and production of IL-12 and IFN-γ by DCs, enhancing their ability to prime cytotoxic T cells (46–48). Further, IFN-γ from NK cells can promote cytotoxic T cell responses (49). NK cell–mediated cancer cell lysis increases the availability of tumor Ags for cross-presentation to T cells by DCs (50), whereas antitumor NK cell functions rely on the production of type I IFNs by DCs (51, 52). Many chemotherapies cause severe DNA damage, leading to upregulation of ligands for NK activating receptors, particularly NKG2D and DNAM-1 (53). Ligation of activating receptors and dysregulation of inhibitory signals result in contact-depending killing of targets and cytokine production. Stressed tumor cells can increase production of HSPs, including CRT and HSP70, which are critical signaling effectors in ICD (11). In multiple tumor models, NK cells recognize HSP70 on the surface of target cells (54). In a xenograft model of human melanoma, HSP70 was found to increase the antitumor activity of NK cells against tumor cells expressing NKG2D ligands MICA/B (55). HSP danger signals may regulate recruitment and maturation of APCs and also drive antitumor NK responses, a concept that deserves further investigation. As with many other cancer treatments, the contribution of NK cells may be a powerful tool for enhancing ICD, especially in the context of OV-based therapies, because viruses can be potent NK cell activators. T cell dysfunction in cancers. A major clinical problem is the rapid development of T cell suppression by tumors. Most cancer Ags are derived from self, and the corresponding TCR repertoire relies on T cells that have escaped negative selection during central tolerance (56). Most patients have T cell repertoires with a low-to-moderate number of clones with low- to moderate-affinity TCRs, limiting overall avidity of anticancer responses. T cells with low/moderate-affinity TCRs risk becoming anergic, where weak MHC:TCR binding or costimulatory signaling results in T cells that are unable to develop effector function (57) and have a limited expansion (58). T cell impairment can also occur through exhaustion, a result of chronic Ag stimulation coupled with poor costimulation. Exhausted T cells in the TME express high levels of inhibitory receptors, cease to produce cytokines, and have altered transcriptional and epigenetic profiles (59, 60). The mutational progression of cancer leads to development of neoantigens that are not found in the normal human genome and are not represented during thymic selection. The accumulation of neoantigens is variable among cancers with melanomas containing high numbers (61). Theoretically, neoantigens represent ideal targets for cancer immunotherapy, assuming that T cells capable of engaging them are superior to self-antigen–specific T cells (62). Intriguingly, T cells with higher-affinity TCRs tend to be preferential targets for exhaustion by tumor-derived factors (63). In practice, high mutational and neoantigen burden correlates with improved responses to cancer immunotherapies, including immune checkpoint blockade (64–67). Indeed, deficiencies in mismatch repair machinery, which facilitate the accruement of somatic mutations, are a predictor for response to checkpoint blockade (68, 69). It is tempting to extrapolate the correlates demonstrated during checkpoint blockade to ICD-driven therapies, which also rely on reactivation of the T cell repertoire, especially because immunogenic chemotherapy sensitizes cancers to immune checkpoint blockade (43). The reliance on a pool of T cells with low-affinity TCRs for anticancer vaccination is a roadblock for in situ vaccination by OVs, because they engage both virus- and tumor-specific T cells, with the nontolerized antiviral response being dominant. Historically, researchers attempted to diminish antiviral T cell responses through immunosuppression or Ag masking via cell carriers to maximize the replication of OVs in tumors (70–72). However, immunosuppression reduces the efficacy of OVs by simultaneously dampening the anticancer immune response. This issue can be addressed through prime-boost vaccination, wherein the anticancer repertoire is primed against a tumor-associated Ag (TAA) and subsequently boosted with a heterologous OV encoding the same TAA (73). By using OVs as booster vaccines, the primary response against viral backbone proteins can be overwhelmed by the secondary response against the TAA expressed by the virus. Several immunogenic therapies lead to activation of ER stress and expression of ecto-CRT (74–76). Although ecto-CRT has a prophagocytic effect, it is countered by CD47. The balance between CRT and CD47 is a determinant of phagocytic uptake of stressed and dying cells, and manipulating it is an important early step in promoting the development of antitumor adaptive immunity (77). Loss of LRP1 receptors on DCs in tumor-bearing hosts impairs phagocytosis induced by ecto-CRT (4). Notably, the balance of ecto-CRT:CD47 ligation can potentially be tipped in favor of prophagocytic signaling through the use of CD47-blocking Abs (16, 78). Tumor cells further limit ICD by defective production or active degrading of ATP. For example, overexpression of the ectonucleotidases CD39 or CD73 promotes degradation of extracellular ATP (79). The primary degradation product is adenosine, which is potently immunosuppressive (80). Adenosine signaling in the TME can impede cytotoxicity and IFN-γ secretion by NK and CD8+ T cells (81, 82), stimulate T cell anergy, and increase infiltration of TRegs (83). Moreover, adenosine is a critical immunosuppressive effector mechanism for TRegs (84), myeloid-derived suppressor cells, and suppressive type 2 tumor-associated macrophages (85, 86). Single nucleotide polymorphisms in purinergic receptors could impair recruitment of leukocytes into tumors by virtue of their inability to properly navigate ATP gradients as seen with polymorphisms in HMGB1 and TLR4, which can limit the immunological effects of ICD (4). During infection with viruses (87) and treatment with chemotherapies (12), cancer cells secrete type I IFNs. The antitumor effects of anthracyclines are, in part, mediated by the induction of type I IFNs after TLR3-mediated sensing of self-RNA secreted after drug-induced damage (12). Tumor cells lacking type I IFN receptors fail to respond properly to anthracyclines (12). In humans, defects or altered expression of type I IFN signaling components influences disease progression and prognosis (12). Necroptosis is a form of programmed cell death triggered by stimuli that engage the TNF superfamily, ligation of various PRRs, and/or genotoxic and oxidative stresses induced by anticancer drugs (88). Unlike apoptosis, necroptosis requires inactivation of caspase-8 and subsequent activation of serine/threonine receptor–interacting protein kinases RIPK1 and RIPK3 (88). Necroptosis activates anticancer immunity and contributes to the immunogenicity of transplantable tumors (89, 90). In contrast, necroptosis is described as immunosuppressive in pancreatic cancers and in the context of autochthonous murine cancer models (91). The effect of necroptosis in spontaneous cancers in mice has yet to be demonstrated. Therefore, the clinical relevance of necroptosis to induction of tumor-specific immunity is debatable. More research is needed to clarify the patterns of inflammatory cytokines and DAMPs released during necroptosis that bias the outcome toward tumor promotion versus immune suppression. Strategies to promote necroptotic ICD will need to consider that some cancers inactivate or lose expression of RIPK1, RIPK3, and the executioner MLKL (92), key components that drive necroptosis (88). OVs are targeted biological therapeutics that infect and kill cancer cells, triggering systemic antitumor immune responses (93). OVs have demonstrated preclinical and clinical success culminating in the U.S. Food and Drug Administration approving the herpesvirus T-Vec for advanced melanomas (94). OVs have the implicit capacity to generate inflammatory responses through production of pathogen-associated molecular patterns (PAMPs) and release of tumor Ags, thus acting as in situ cancer vaccines (Fig. 1B). Engineering expression of immunomodulatory transgenes, such as cytokines (e.g., GM-CSF for T-Vec), or immune checkpoint inhibitors enhances OV-driven antitumor immunity (95, 96). Interactions between viruses and hosts have shaped a complex network of cell death and antiviral signaling pathways and viral escape mechanisms (97, 98). Cancer represents an aberration to virus–host interactions, because many cancer mutations (99) come at a fitness cost to the antiviral response or allow viruses to usurp upregulated growth pathways. Several OVs elicit ICD through engagement of cell death pathways resulting in diverse expression of DAMPs. The anticancer effects of OVs may be potentiated by combination with other ICD inducers (100). Adenovirus (Ad)-based OVs have been in clinical development for decades and are approved in China for head and neck cancers (101). Ad5 containing a Δ-24-RGD cancer-targeting mutation kills glioma cells through autophagic cell death and activation of caspase-8, both hallmarks of ICD (102), and induces tumor Ag-specific adaptive immune responses (103). The mechanistic understanding of Ad-driven autophagic cell death led to preclinical testing of Ad combined with the alkylating agent temozolomide (TMZ) (104). TMZ also induces autophagy, and in combination with Ad5 leads to induction of ICD in breast and prostate cancer cell lines. This combination was applied to a cohort of 17 patients with advanced solid tumors, where it was well tolerated and improved anticancer T cell responses and overall survival (104). Intriguingly, there was a correlation between high levels of HMGB1 in patient serum after treatment and improved survival. A phase 1 trial is under way to evaluate the combination of Ad and TMZ in glioblastoma patients (DNAtrix, NCT01956734), showing how an evidence-based combinatorial approach with OVs and approved drugs to promote ICD can be translated to the clinic. However, each combination of a chemotherapeutic and OV should be carefully investigated to ensure that there are no reciprocal deleterious effects. Vaccinia virus (VACV) is a poxvirus progressing toward regulatory approval (105). VACV induces a combined form of cell death, involving immunogenic apoptosis and necrosis (106). Given that poxviruses carry genes to antagonize cell death pathways, VACV causes an incomplete emission of ICD-inducing DAMPs (107). Removing the viral antiapoptotic genes SPI-1 and SPI-2 enhanced necrosis and release of HMGB1, extending survival in immunocompetent tumor-bearing mice (108). Unfortunately, VACV does not increase extracellular ATP (106, 109). This may be a common feature among OVs because ATP is a highly used resource during production of viral progeny. The potential of combining VACV with ICD inducers has been explored for drug-resistant ovarian cancers. Komorowski et al. (110) combined recombinant VACV with doxorubicin, a standard of care anthracycline. In vitro treatment of ovarian cancer cells with VACV enhanced susceptibility to doxorubicin, likely mediated through type I IFNs, and increased DC tumor Ag uptake. A bona fide ICD vaccination experiment showed that tumor cells killed with VACV and doxorubicin limited engraftment compared with either treatment alone. VACV-induced ICD has been exploited to shape the TME to favor antitumor immunity. VACV infection can release tumor Ags into an inflamed microenvironment consisting of proinflammatory cytokines, DAMPs and PAMPs, but simultaneously increased expression of PDL-1 on recruited leukocytes, limiting cancer-specific immune responses (111). Treatment with anti–PDL-1 following VACV prevented the shutdown of cancer-specific T cells and reduced infiltration of TRegs and immunosuppressive myeloid-derived suppressor cells, resulting in improved efficacy (111). Thus, combination of immunomodulatory checkpoint inhibitors with ICD-inducing therapies like OVs deserves further preclinical and clinical investigation. Three key DAMPs (ecto-CRT, extracellular HMGB1, and ATP) are often used as biochemical markers of ICD (112). Indeed, for ICD-inducing chemotherapeutics, these DAMPs appear necessary to efficiently induce immune responses (4). However, they are not absolute indicators of ICD (11): drugs such as cardiac glycosides show the stereotypical in vitro biochemical features of ICD but fail to induce immunological memory in vaccination assays, suggesting a requirement for additional unidentified DAMPs in induction of bona fide ICD (113). Thus, strategies to enhance ICD should increase the quantity and broaden the diversity of DAMPs, while simultaneously upregulating expression of cognate receptors on innate immune cells. OVs cause premortem stress leading to secretion of one or more DAMPs that are typically released during chemotherapy (100). However, the immunogenicity of cell death induced by OVs, especially the signaling cascades preceding secretion of DAMPs, is not well characterized. Future studies should focus on dissecting the relevance of DAMPs released during OV infection with therapeutic outcomes. Because viruses are amenable to genetic modification, OVs can be engineered to express ICD-associated DAMPs (100) or components of ICD signaling pathways that are mutated or missing in tumor cells, thus increasing their immunotherapeutic potential. Large DNA OVs such as HSV-1 encode many proteins that counter ICD and innate and adaptive immunity (114). Characterizing the ICD-evading proteins of OVs would provide the rationale for engineering mutant viruses lacking these proteins. Although ICD-inducing therapies are promising, monotherapies often promote the emergence of resistant tumor variants (40). As a result, combination therapies will likely be required to provide cures. There is some evidence to suggest that broadening the induction of DAMPs potentiates anticancer immunity. For some chemotherapies, failure to initiate one or more of the hallmark DAMPs results in an inability to mediate immunogenic effects (4). For example, cisplatin-treated tumors release ATP and HMGB1, but fail to cause sufficient ER stress to expose ecto-CRT. Incorporating ER stressors such as OVs can promote the immunogenicity of cisplatin (115). In a different approach, inhibitors of nucleotidases were administered along with ICD-inducing therapies in patient tumor types that express high levels of CD39 and CD73 (115). Also, subversion of HMGB1 release by cancer cells reduces the potential for signaling through TLR4, which can be countered by administering synthetic TLR4 agonists such as dendrophilin (115). In a particularly promising combination approach, we showed that treating tumor-bearing mice with immunogenic HSV-1 OV and immunogenic chemotherapy effectively potentiated ICD (116, 117). Identifying ideal combinations of ICD-inducing agents to minimize tumor escape variants represents an important future research direction. The use of OVs with other ICD inducers is particularly promising. Checkpoint blockade immunotherapies exert durable anticancer effects in patients who already have T cell infiltrates (118). However, only a fraction of patients respond to checkpoint blockade immunotherapy (118). From preclinical studies (43) it is plausible to speculate that ICD induction will activate T cell responses with broad antigenic coverage in human patients and increase the proportion of patients who respond to checkpoint blockade immunotherapies. Two lines of evidence suggest that the type of cancer cell death has an immunomodulatory effect: 1) T cell infiltration of human breast cancers at diagnosis (a high ratio of CD8+ T cells to TRegs) predicts efficacy in patients receiving some chemotherapies (119), and 2) treatment of cancer patients with adoptive transfer of DCs loaded with dying cancer cells showing features of ICD leads to development of potent antitumor immunity (120). Although these studies suggest that ICD may influence cancer patient outcomes, from its early conception to experimental validation, the field of ICD has relied heavily on the use of immunogenic transplantable tumor models. Although these models provide tools to study ICD, they do not capture the immunosuppressive nature of spontaneous human tumors. Recently, it was shown that immunogenic chemotherapy using Oxa-Cyc induces T cell infiltration in a KRAS/Trp53-mutated lung adenocarcinoma model and sensitizes tumors to checkpoint blockade immunotherapy (43). Although oxaliplatin has been well studied for its direct cell death–mediated immunogenic potential, cyclophosphamide is not well characterized (121, 122). Nonetheless, prophylactic vaccination with Oxa-Cyc–killed tumor cells provided protection against spontaneous tumor development (43). In sharp contrast, a previous report used spontaneously arising mammary tumors to conclude that antitumor effects of chemotherapy are independent of the immune system (123). This study used chemotherapies that were well characterized for their immunogenic effect in transplantable tumor models. However, the chemotherapies were administered systemically at a high dose, which could cause general suppression of the immune system, leading to loss of therapeutic efficacy. In short, murine studies show that different types of chemotherapies and dosing schedules exert different immunogenic and therapeutic effects in a model-dependent fashion. As a result, it remains a question what type of nonimmunogenic tumor model will best predict the inherent immunogenic properties of chemotherapies. Moreover, translating preclinical ICD observations into the clinic requires understanding the inherent immunological differences between humans and mice (124). A comparative study of inflammatory stressors in humans and mice showed remarkably different genomic responses (125). Although in vitro biochemical assays to detect ecto-CRT, extracellular ATP, and HMGB1 can be used to predict ICD in human cell lines, these assays cannot conclusively prove ICD. Vaccination experiments with dying tumor cells in immunocompetent mice are the gold standard assay for ICD. In vitro DC maturation assays using dying human cancer cells cocultured with DCs may be superior predictors of ICD. Moreover, the development of humanized mice for dying human cancer cell vaccination assays will be particularly useful for predicting ICD in humans. ICD represents a new and exciting paradigm in the field of cancer research. Dramatic advancements have been achieved in defining key hallmarks associated with ICD and how they mediate their effects. However, rigorous testing in various cancer models has revealed that there is likely an array of yet-to-be-identified DAMPs that can drive optimal ICD. Notably, the primary emphasis in this field has been on understanding the role of ICD in promoting tumor-specific T cell responses. But ideal tumor-specific immunity will be underpinned by multimechanistic effector mechanisms. There is a small but growing body of evidence that provides the rationale and some mechanistic insight required to start designing ICD inducers to engage NK cells, along with T lymphocytes. A gaping hole exists in terms of understanding the role of ICD inducers in tumor-specific Ab responses. This may be due to the historical demonstration that Abs fail to play a role in ICD caused by anthracyclines (126). However, Abs represent an important arm of the immune system for targeting surface-expressed tumor Ags, promoting Ag presentation to T cells via Ab-mediated uptake of proteins from dying cells and facilitating Ab-dependent cellular cytotoxicity. As such, the identification of nonanthracycline ICD inducers that can promote Ab responses may be a way to tap into this currently unharnessed effector mechanism. We contend that combining OVs with classical ICD-inducing chemotherapeutics may represent a particularly promising way to optimize ICD-focused therapies for clinical use. OVs and drugs overlap in their ability to induce the key hallmarks of ICD (exogenous ATP and HMGB1, and ecto-CRT) in dying cancer cells. Moreover, viruses are potent inducers of type I IFNs, which have recently been defined as the fourth hallmark of ICD. They also induce the expression of broad arrays of DAMPs, which may include at least some of those that are currently undefined but likely required for optimal ICD. OVs are also capable of engaging multiple pathways of cell death, which could minimize the risk of selecting ICD-escape variants. Finally, viruses potently activate NK and B cells, thereby providing the potential to recruit these additional immunological effector mechanisms. Using OVs to potentiate ICD-inducing drugs has excellent potential for reactivating the tumor-killing potential of the immune systems of cancer patients. This could provide a relatively cost-effective, short-duration, personalized treatment for cancers. This work was supported by the Terry Fox Research Institute (Project 1041; to B.W.B. ), the Canadian Breast Cancer Foundation and the Canadian Cancer Society (to K.L.M. ), the National Sciences and Engineering Research Council (to S.K.W. ), a Canadian Graduate Scholarship (Natural Sciences and Engineering Research Council of Canada; stipend funding to J.P.v.V. ), and a Highly Qualified Personnel Scholarship (Ontario Ministry of Agriculture, Food and Rural Affairs; stipend funding to J.P.v.V.).
. 2004. The three Es of cancer immunoediting. Annu. Rev. Immunol. 22: 329–360. 2017. Immune-suppressing cellular elements of the tumor microenvironment. Annu. Rev. Cancer Biol. 1: 241–255. 2013. Cytokine patterns in patients with cancer: a systematic review. Lancet Oncol. 14: e218–e228.
. 2017. Immunogenic cell death in cancer and infectious disease. Nat. Rev. Immunol. 17: 97–111.
. 2014. Immunogenic calreticulin exposure occurs through a phylogenetically conserved stress pathway involving the chemokine CXCL8. Cell Death Differ. 21: 59–68. 1994. Tolerance, danger, and the extended family. Annu. Rev. Immunol. 12: 991–1045.
. 2014. High hydrostatic pressure induces immunogenic cell death in human tumor cells. Int. J. Cancer 135: 1165–1177.
. 2014. ER stress, autophagy and immunogenic cell death in photodynamic therapy-induced anti-cancer immune responses. Photochem. Photobiol. Sci. 13: 474–487.
. 2015. The oncolytic peptide LTX-315 triggers necrotic cell death. Cell Cycle 14: 3506–3512.
. 2014. Oncolytic immunotherapy: dying the right way is a key to eliciting potent antitumor immunity. Front. Oncol. 4: 74.
. 2014. Consensus guidelines for the detection of immunogenic cell death. Oncoimmunology 3: e955691.
. 2014. Cancer cell-autonomous contribution of type I interferon signaling to the efficacy of chemotherapy. Nat. Med. 20: 1301–1309.
. 2007. Calreticulin exposure dictates the immunogenicity of cancer cell death. Nat. Med. 13: 54–61.
. 2003. Scavenger receptor-A mediates gp96/GRP94 and calreticulin internalization by antigen-presenting cells. EMBO J. 22: 6127–6136.
. 2004. SREC-I, a type F scavenger receptor, is an endocytic receptor for calreticulin. J. Biol. Chem. 279: 51250–51257.
. 2000. Necrotic but not apoptotic cell death releases heat shock proteins, which deliver a partial maturation signal to dendritic cells and activate the NF-kappa B pathway. Int. Immunol. 12: 1539–1546.
. 1999. Heat shock protein 70 induced during tumor cell killing induces Th1 cytokines and targets immature dendritic cell precursors to enhance antigen uptake. J. Immunol. 163: 1398–1408.
. 2011. Autophagy-dependent anticancer immune responses induced by chemotherapeutic agents in mice. Science 334: 1573–1577.
. 2014. Molecular mechanisms of ATP secretion during immunogenic cell death. Cell Death Differ. 21: 79–91.
. 2014. Chemotherapeutic drugs induce ATP release via caspase-gated pannexin-1 channels and a caspase/pannexin-1-independent mechanism. J. Biol. Chem. 289: 27246–27263.
. 2015. High mobility group box protein 1 (HMGB1): the prototypical endogenous danger signal. Mol. Med. 21: S6–S12.
. 2003. Monocytic cells hyperacetylate chromatin protein HMGB1 to redirect it towards secretion. EMBO J. 22: 5551–5560.
. 2014. JAK/STAT1 signaling promotes HMGB1 hyperacetylation and nuclear translocation. Proc. Natl. Acad. Sci. USA 111: 3068–3073.
. 2012. Mutually exclusive redox forms of HMGB1 promote cell recruitment or proinflammatory cytokine release. J. Exp. Med. 209: 1519–1528.
. 2002. Release of chromatin protein HMGB1 by necrotic cells triggers inflammation. Nature 418: 191–195.
. 2006. HMGB1 signals through toll-like receptor (TLR) 4 and TLR2. Shock 26: 174–179.
. 2007. The interaction between HMGB1 and TLR4 dictates the outcome of anticancer chemotherapy and radiotherapy. Immunol. Rev. 220: 47–59.
. 2010. A critical cysteine is required for HMGB1 binding to Toll-like receptor 4 and activation of macrophage cytokine release. Proc. Natl. Acad. Sci. USA 107: 11942–11947.
. 2004. High mobility group box protein 1: an endogenous signal for dendritic cell maturation and Th1 polarization. J. Immunol. 173: 307–313.
. 2009. Serum high mobility group box-1 (HMGB1) is closely associated with the clinical and pathologic features of gastric cancer. J. Transl. Med. 7: 38.
. 2016. HMGB1 and its hyperacetylated isoform are sensitive and specific serum biomarkers to detect asbestos exposure and to identify mesothelioma patients. Clin. Cancer Res. 22: 3087–3096.
. 2015. Integrated transcriptional profiling and genomic analyses reveal RPN2 and HMGB1 as promising biomarkers in colorectal cancer. Cell Biosci. 5: 53.
. 2014. HMGB1-mediated autophagy promotes docetaxel resistance in human lung adenocarcinoma. Mol. Cancer 13: 165.
. 2015. Serum HMGB1 is a predictive and prognostic biomarker for oncolytic immunotherapy. Oncoimmunology 4: e989771.
. 2012. Cancer cell secretion of the DAMP protein HMGB1 supports progression in malignant mesothelioma. Cancer Res. 72: 3290–3301.
. 2012. HMGB1 promotes drug resistance in osteosarcoma. Cancer Res. 72: 230–238.
. 2013. High mobility group box 1 released from necrotic cells enhances regrowth and metastasis of cancer cells that have survived chemotherapy. Eur. J. Cancer 49: 741–751.
. 2015. Molecular and translational classifications of DAMPs in immunogenic cell death. Front. Immunol. 6: 588.
. 2012. Immunogenic cell death and DAMPs in cancer therapy. Nat. Rev. Cancer 12: 860–875.
. 2015. Type I interferons in anticancer immunity. Nat. Rev. Immunol. 15: 405–414.
. 2013. Anticancer chemotherapy-induced intratumoral recruitment and differentiation of antigen-presenting cells. Immunity 38: 729–741.
. 2016. Immunogenic chemotherapy sensitizes tumors to checkpoint blockade therapy. Immunity 44: 343–354.
. 2015. Prognostic value of tumor-infiltrating FoxP3+ regulatory T cells in cancers: a systematic review and meta-analysis. Sci. Rep. 5: 15179.
. 2016. Expansion and activation of CD103(+) dendritic cell progenitors at the tumor site enhances tumor responses to therapeutic PD-L1 and BRAF inhibition. Immunity 44: 924–938.
. 2005. NK-dependent DC maturation is mediated by TNFalpha and IFNgamma released upon engagement of the NKp30 triggering receptor. Blood 106: 566–571.
. 2005. DC-NK cell cross talk as a novel CD4+ T-cell-independent pathway for antitumor CTL induction. Blood 106: 338–344.
. 2003. Natural killer cells activated by MHC class I(low) targets prime dendritic cells to induce protective CD8 T cell responses. Immunity 19: 561–569.
. 2004. Induced recruitment of NK cells to lymph nodes provides IFN-γ for T(H)1 priming. Nat. Immunol. 5: 1260–1265.
. 2009. NK-cell-mediated killing of target cells triggers robust antigen-specific T-cell-mediated and humoral responses. Blood 113: 6593–6602.
. 2011. IL-15 and type I interferon are required for activation of tumoricidal NK cells by virus-infected dendritic cells. Cancer Res. 71: 2497–2506.
. 2015. Type I IFN signaling on dendritic cells is required for NK cell-mediated anti-tumor immunity. Innate Immun. 21: 626–634.
. 2009. ATM-ATR-dependent up-regulation of DNAM-1 and NKG2D ligands on multiple myeloma cells by therapeutic agents results in enhanced NK-cell susceptibility and is associated with a senescent phenotype. Blood 113: 3503–3511.
. 2003. Interaction of heat shock protein 70 peptide with NK cells involves the NK receptor CD94. Biol. Chem. 384: 267–279.
. 2007. The heat shock protein HSP70 promotes mouse NK cell activity against tumors that express inducible NKG2D ligands. J. Immunol. 179: 5523–5533.
. 2015. Clonal deletion prunes but does not eliminate self-specific αβ CD8(+) T lymphocytes. Immunity 42: 929–941.
. 2012. The three main stumbling blocks for anticancer T cells. Trends Immunol. 33: 364–372.
. 2009. Complete but curtailed T-cell response to very low-affinity antigen. Nature 458: 211–214.
. 2016. The epigenetic landscape of T cell exhaustion. Science 354: 1165–1169.
. 2015. Neoantigens in cancer immunotherapy. Science 348: 69–74.
. 2017. Targeting neoantigens to augment antitumour immunity. Nat. Rev. Cancer 17: 209–222.
. 2017. Impact of antigen affinity on T cell dysfunction in solid tumors. J. Immunol. 198: 141.1.
. 2014. Efficient identification of mutated cancer antigens recognized by T cells associated with durable tumor regressions. Clin. Cancer Res. 20: 3401–3410.
. 2016. Low mutation burden in ovarian cancer may limit the utility of neoantigen-targeted vaccines. PLoS One 11: e0155189.
. 2015. Cancer immunology. Mutational landscape determines sensitivity to PD-1 blockade in non-small cell lung cancer. Science 348: 124–128.
. 2015. Genomic correlates of response to CTLA-4 blockade in metastatic melanoma. [Published erratum appears in 2015 Science 350: aad8366; 2016 Science 352: aaf8264.] Science 350: 207–211.
. 2017. Mismatch repair deficiency predicts response of solid tumors to PD-1 blockade. Science 357: 409–413.
. 2015. PD-1 blockade in tumors with mismatch-repair deficiency. N. Engl. J. Med. 372: 2509–2520.
. 1999. Oncolytic virus therapy of multiple tumors in the brain requires suppression of innate and elicited antiviral responses. Nat. Med. 5: 881–887.
. 2008. Immunosuppression enhances oncolytic adenovirus replication and antitumor efficacy in the Syrian hamster model. Mol. Ther. 16: 1665–1673.
. 2007. Carrier cell-based delivery of an oncolytic virus circumvents antiviral immunity. Mol. Ther. 15: 123–130.
. 2010. Potentiating cancer immunotherapy using an oncolytic virus. Mol. Ther. 18: 1430–1439.
. 2009. Mechanisms of pre-apoptotic calreticulin exposure in immunogenic cell death. EMBO J. 28: 578–590.
. 2008. The co-translocation of ERp57 and calreticulin determines the immunogenicity of cell death. Cell Death Differ. 15: 1499–1509.
. 2010. Immunogenic tumor cell death for optimal anticancer therapy: the calreticulin exposure pathway. Clin. Cancer Res. 16: 3100–3104.
. 2015. The ever-expanding immunomodulatory role of calreticulin in cancer immunity. Front. Oncol. 5: 35.
. 2010. Calreticulin is the dominant pro-phagocytic signal on multiple human cancers and is counterbalanced by CD47. Sci. Transl. Med. 2: 63ra94.
. 2012. Subversion of the chemotherapy-induced anticancer immune response by the ecto-ATPase CD39. Oncoimmunology 1: 393–395.
. 2017. The ectonucleotidases CD39 and CD73: novel checkpoint inhibitor targets. Immunol. Rev. 276: 121–144.
. 2010. CD73 on tumor cells impairs antitumor T-cell responses: a novel mechanism of tumor-induced immune suppression. Cancer Res. 70: 2245–2255.
. 2011. Ectonucleotidases CD39 and CD73 on OvCA cells are potent adenosine-generating enzymes responsible for adenosine receptor 2A-dependent suppression of T cell function and NK cell cytotoxicity. Cancer Immunol. Immunother. 60: 1405–1418.
. 2008. A2A receptor signaling promotes peripheral tolerance by inducing T-cell anergy and the generation of adaptive regulatory T cells. Blood 111: 251–259.
. 2007. Adenosine generation catalyzed by CD39 and CD73 expressed on regulatory T cells mediates immune suppression. J. Exp. Med. 204: 1257–1265.
. 2011. Adenosinergic regulation of the expansion and immunosuppressive activity of CD11b+Gr1+ cells. J. Immunol. 187: 6120–6129.
. 2014. Myeloid expression of adenosine A2A receptor suppresses T and NK cell responses in the solid tumor microenvironment. Cancer Res. 74: 7250–7259.
. 2015. The role of oncolytic virus immunotherapies to subvert cancer immune evasion. Future Oncol. 11: 675–689.
. 2015. Necroptosis and its role in inflammation. Nature 517: 311–320.
. 2015. RIPK1 and NF-κB signaling in dying cells determines cross-priming of CD8+ T cells. Science 350: 328–334.
. 2016. Vaccination with necroptotic cancer cells induces efficient anti-tumor immunity. Cell Reports 15: 274–287.
. 2016. The necrosome promotes pancreatic oncogenesis via CXCL1 and Mincle-induced immune suppression. Nature 532: 245–249.
. 2017. Relevance of necroptosis in cancer. Immunol. Cell Biol. 95: 137–145.
. 2015. Oncolytic viruses: a new class of immunotherapy drugs. Nat. Rev. Drug Discov. 14: 642–662.
. 2015. First oncolytic virus approved for melanoma immunotherapy. Oncoimmunology 5: e1115641.
. 2014. CTLA-4 and PD-L1 checkpoint blockade enhances oncolytic measles virus therapy. Mol. Ther. 22: 1949–1959.
. 2016. Vectorization in an oncolytic vaccinia virus of an antibody, a Fab and a scFv against programmed cell death -1 (PD-1) allows their intratumoral delivery and an improved tumor-growth inhibition. Oncoimmunology 5: e1220467.
. 2012. Rules of engagement: molecular insights from host-virus arms races. Annu. Rev. Genet. 46: 677–700.
. 2017. Programmed cell death as a defence against infection. Nat. Rev. Immunol. 17: 151–164.
. 2011. Hallmarks of cancer: the next generation. Cell 144: 646–674.
. 2014. Oncolytic virotherapy and immunogenic cancer cell death: sharpening the sword for improved cancer treatment strategies. Mol. Ther. 22: 251–256. 2006. China approves world’s first oncolytic virus therapy for cancer treatment. J. Natl. Cancer Inst. 98: 298–300.
. 2011. Human adenovirus type 5 induces cell lysis through autophagy and autophagy-triggered caspase activity. J. Virol. 85: 4720–4729.
. 2014. Delta-24-RGD oncolytic adenovirus elicits anti-glioma immunity in an immunocompetent mouse model. PLoS One 9: e97407.
. 2013. Oncolytic adenovirus with temozolomide induces autophagy and antitumor immune responses in cancer patients. Mol. Ther. 21: 1212–1223.
. 2015. 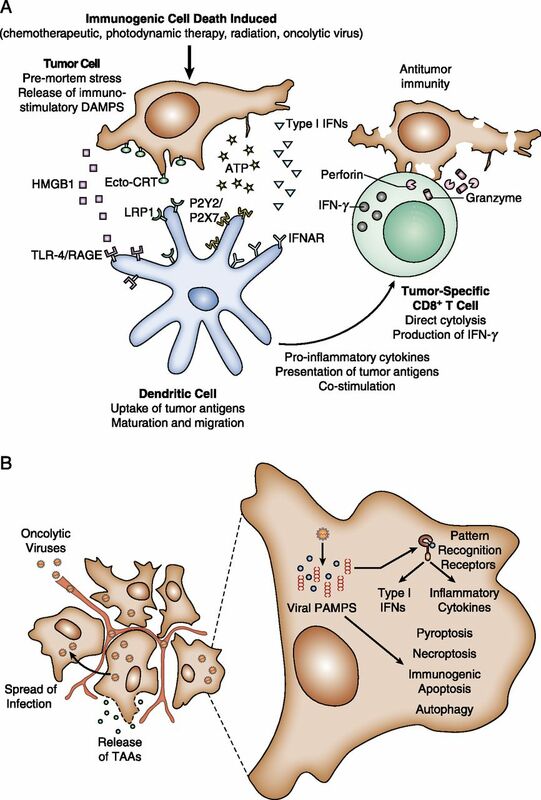 The emerging therapeutic potential of the oncolytic immunotherapeutic Pexa-Vec (JX-594). Oncolytic Virother. 4: 25–31.
. 2017. Immunogenicity of oncolytic vaccinia viruses JX-GFP and TG6002 in a human melanoma in vitro model: studying immunogenic cell death, dendritic cell maturation and interaction with cytotoxic T lymphocytes. Onco Targets Ther. 10: 2389–2401.
. 2014. Analysis of the anti-apoptotic activity of four vaccinia virus proteins demonstrates that B13 is the most potent inhibitor in isolation and during viral infection. J. Gen. Virol. 95: 2757–2768.
. 2005. The enhanced tumor selectivity of an oncolytic vaccinia lacking the host range and antiapoptosis genes SPI-1 and SPI-2. Cancer Res. 65: 9991–9998.
. 2015. Oncolytic virotherapy with an armed vaccinia virus in an orthotopic model of renal carcinoma is associated with modification of the tumor microenvironment. Oncoimmunology 5: e1080414.
. 2016. Reprogramming antitumor immunity against chemoresistant ovarian cancer by a CXCR4 antagonist-armed viral oncotherapy. Mol Ther Oncolytics 3: 16034.
. 2017. Rational combination of oncolytic vaccinia virus and PD-L1 blockade works synergistically to enhance therapeutic efficacy. Nat. Commun. 8: 14754.
. 2013. Immunogenic cell death in cancer therapy. Annu. Rev. Immunol. 31: 51–72.
. 2012. Cardiac glycosides exert anticancer effects by inducing immunogenic cell death. Sci. Transl. Med. 4: 143ra99.
. 2010. Viral strategies for the evasion of immunogenic cell death. J. Intern. Med. 267: 526–542.
. 2015. Combinatorial strategies for the induction of immunogenic cell death. [Published erratum appears in 2015 Front. Immunol. 6: 275.] Front. Immunol. 6: 187.
. 2013. Combining oncolytic HSV-1 with immunogenic cell death-inducing drug mitoxantrone breaks cancer immune tolerance and improves therapeutic efficacy. Cancer Immunol. Res. 1: 309–319.
. 2013. Rewiring cancer cell death to enhance oncolytic viro-immunotherapy. Oncoimmunology 2: e27138.
. 2013. Nivolumab plus ipilimumab in advanced melanoma. N. Engl. J. Med. 369: 122–133.
. 2011. In situ immune response after neoadjuvant chemotherapy for breast cancer predicts survival. J. Pathol. 224: 389–400.
. 2010. Improved clinical outcome in indolent B-cell lymphoma patients vaccinated with autologous tumor cells experiencing immunogenic death. Cancer Res. 70: 9062–9072.
. 2011. Cyclophosphamide synergizes with type I interferons through systemic dendritic cell reactivation and induction of immunogenic tumor apoptosis. Cancer Res. 71: 768–778.
. 2011. Immunomodulatory effects of cyclophosphamide and implementations for vaccine design. Semin. Immunopathol. 33: 369–383.
. 2012. Chemotherapy response of spontaneous mammary tumors is independent of the adaptive immune system. Nat. Med. 18: 344–346, author reply 346.
. 2004. Of mice and not men: differences between mouse and human immunology. J. Immunol. 172: 2731–2738.
. 2014. Contribution of humoral immune responses to the antitumor effects mediated by anthracyclines. Cell Death Differ. 21: 50–58.